The PPC strives to give every cultural heritage organization within Colorado and Wyoming the opportunity to share their unique collections with each other and the rest of the world through inclusion in the Digital Public Library of America. To better meet the needs of the disparate communities within our two states, we have designed three levels of participation. If you would like more information on the roles and responsibilities of these levels please contact Leigh Jeremias at ljeremias@coloradovirtuallibrary.org. 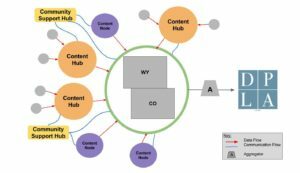 Content Hubs: Content Hubs are institutions that provide digital content to the PPC but also support the participation of other institutions that may not have the ability or resources to do so on their own. The form that this support takes is varied and can include hosting, metadata creation/mitigation, digitization, training, best practices, grant writing, the sky is the limit. However, regardless of the nature of the support relationships developed, the PPC’s relationship and participation agreement is with the Content Hub not with the Content Hub’s individual partners. We refer to these Content Hub partners as contributors to the PPC. Community Support Hubs: Community Support Hubs are organizations that represent and support institutions that are part of their membership or community. It is anticipated that these Community Support Hub partners are not direct content providers but provide support services to their communities in the form of communication, facilitation and education. The PPC’s relationship and participation agreement is with the Community Support Hub and not with the Support Hub’s members. Content Nodes: Content Nodes are institutions that only supply their own digital content to the PPC. Institutions may begin their relationship with the PPC as Content Nodes, but become Content Hubs over time. This is not only permitted, but encouraged. The more we can facilitate the sharing of resources and expertise between organizations, the better for the PPC as a whole. Affiliates: Affiliates are institutions that may not have the ability to participate in the PPC on their own. They can supply content to the PPC through a partnership with a Content Hub. A service of the Colorado & Wyoming State Libraries - through IMLS funding.